1 5/8 in. (4.2 cm.) diam. Sydney L. Moss Ltd., London, March, 1991. Little is known about the artist Jiang Qianli, and he has been attributed to a broad range of dates, although recent research suggests he worked in the 17th century. For further information on Jiang Qianli, also known as Qiushui, see Li Zhongqing, A Mother-of-Pearl Lacquer Tray by Jiang Qianli, p. 63, and Wenwu, 1959:11, pp. 59-61. 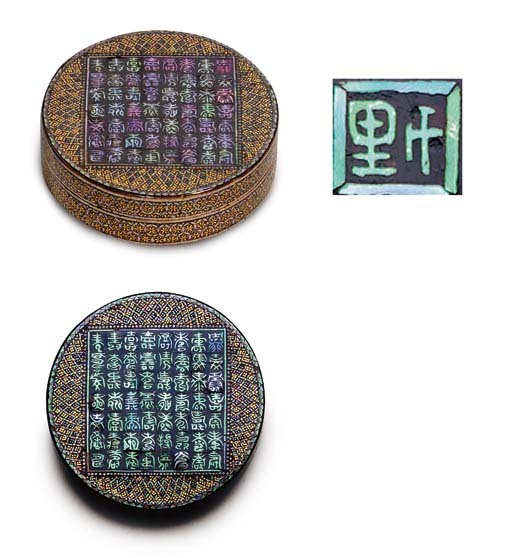 See the inlaid covered box of slightly larger size by Jiang Qianli, illustrated by G. Tsang and H. Moss in Arts from the Scholar's Studio, Hong Kong, 1986, p. 169, no. 144, where the authors discuss the remarkable skill shown in the fine inlay work. See, also, a related covered box by the artist illustrated in 2,000 Years of Chinese Lacquer, The Chinese University of Hong Kong, 1993, p. 186, no. 97.